We've been busy this weekend fulfilling one of my whirlwind wishes. 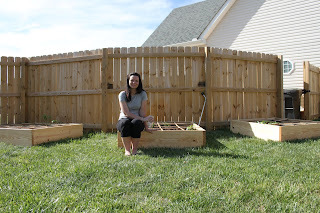 Last week I decided I had to have a vegetable and herb garden. 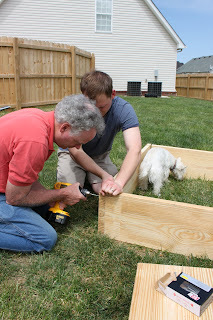 I actually got the idea of a raised garden from my Uncle who had done one a year ago. 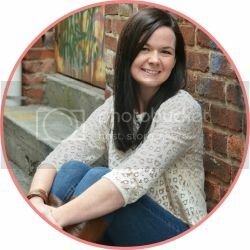 I did a bunch of research, gathered the materials, and got to work! First of all if you want to do this, you need to get the book that made this all possible. I borrowed mine from my Uncle, but I plan on purchasing my own immediately. 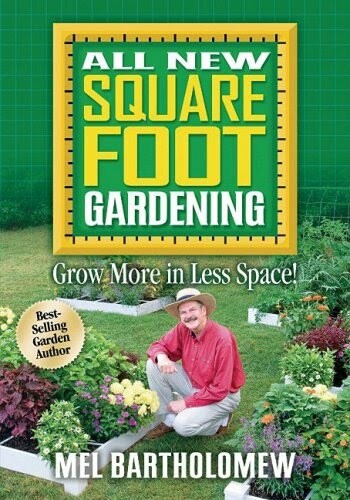 It's the All New Square Foot Gardening book by Mel Bartholomew. It will tell you absolutely everything you need to know to successfully start this type of garden. 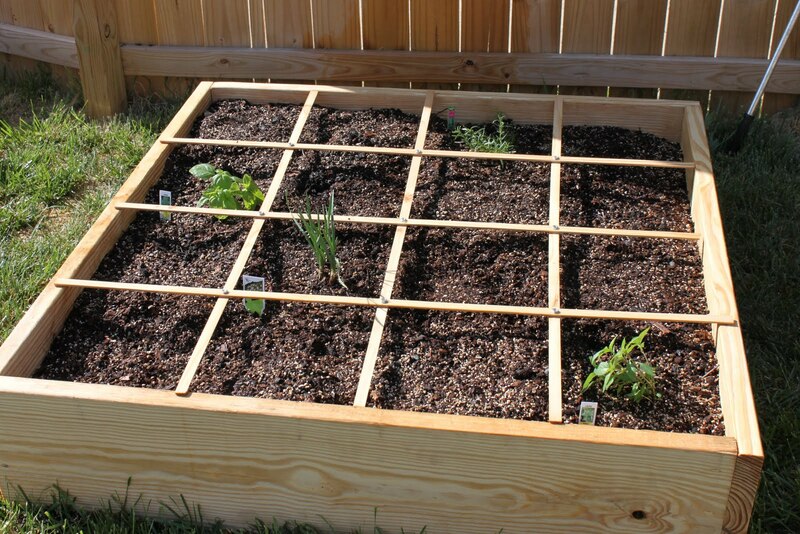 The main benefits of square foot gardening is it has awesome soil, little to no weeds, can ease bending over if built high enough, can be built anywhere even if you don't have a yard, and contains an adequate amount of veggies to feed a family of 4 in such little space! Now for a brief overview of how to do it. First you need to make a plan. Decide how big you want it, where you want it, and what all you want to put in it. They recommend you put it on the north side of the yard for optimal sun and to prevent plants from shading each other. Also remember you can make it as long as you want, but make it no more than 4 feet wide so you can easily reach all sides. We made ours 4ft wide by 4ft high by 12in tall. Finally you can put pretty much anything you want in it. 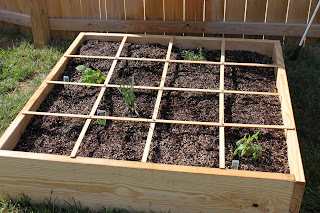 There are guides in the book and online as to when to plant what and how many seeds or plants you can put in each square. Now, go gather your materials. - Weed blocker - The book suggests digging up the first layer of grass and then putting the weed blocker down. We didn't, I'll let you know how it goes. 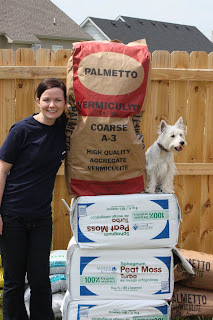 You might have to call around for the 4cubic foot bag of vermiculite. I called my local Co-Op and they had it in stock. You also need to buy the compressed version of Peat Moss. 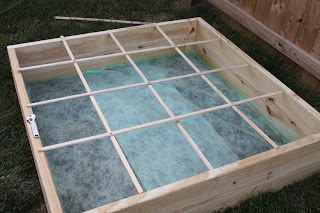 It only took 1 4cuft bag of vermiculite and 1 3cuft bag of compressed peat moss to be enough for one of my 4x4x1 boxes. The book suggests you also buy 5 different types of compost/manure. I used the 5 that were available to me at Lowes and Co-Op. 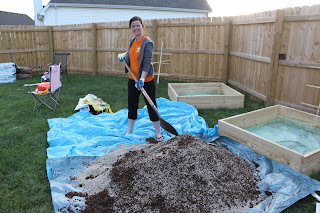 Mine was a mixture of cow manure, chicken manure, mushroom compost, humus, and evergreen compost.......yeah....smelly! - Get a Large Tarp to mix everything together. - Lastly, buy your plants and seeds. 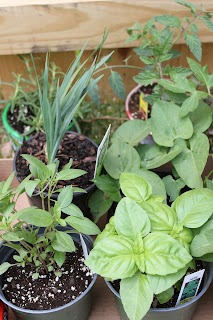 For now I bought a few herb plants, tomato plants, and bean plants as well as seed versions of each. 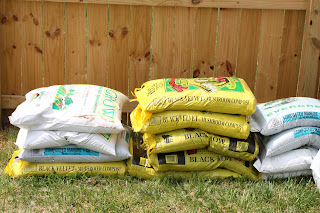 It will be cheaper to plant seeds but it will require more patience so I thought a mix of both would work best for me. I plan on adding more variety later. Now for the building! Screw your boards together and be sure to rotate the corners so you end up with a truly square box! Next insert the weed blocker by stapling it to the sides of the box and build your grid. This was probably the biggest pain of the day. It's hard getting those little sticks to stay where you want them and be able to drill holes without the rest of them all moving around. We started with 4ft long wood lath...it might have been easier if it was longer then cut to size afterwards. Now for the fun part - mixing everything together! Pour everything out on the tarp and start mixing! We did one box at a time which worked out well. Yay! Now it's time for planting. The awesome thing about this is that you never have to do it again!!! 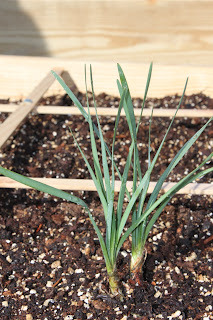 When you dig up roots of old plants and plant new ones, you can just add a little compost. Make sure you have a plan on what you want to plant and where you need to plant it. You need tall plants in the back and short ones in the front so no shading occurs. 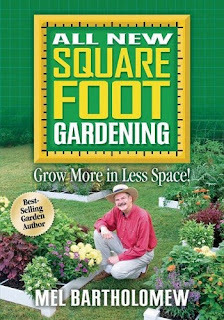 The book and some websites on the internet tell you just how many plants or seeds you can put in each little square. 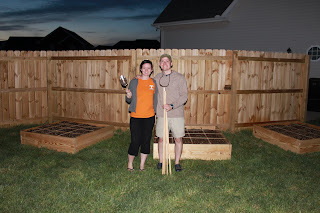 Hopefully sometime this week we will be building our trellises for the beans and tomatoes I planted. 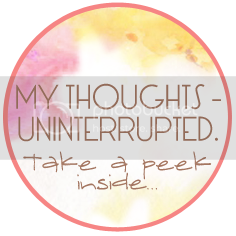 I'm sure I will be providing updates! Very cool. I would love to do something like this but I have the farthest thing from a green thumb!! This is very neat. I would love to grow a garden, but I think we may be moving soon and don't want to set it all up and have to leave it when we move! wow, i am seriously impressed! !